This larger fin comes standard on the Oogle. It also works great for added stability on any other Phase 5 Board such as the kid sized Scamp. 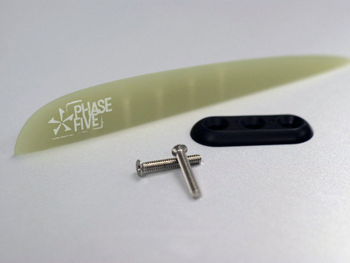 This is a replacement nosefin used for added stability when switch riding or spinning. Q. What size screws do I need for my Board? A. The screw sizes are based on the thickness of each board. For all the current models please refer to the individual board to determine board thickness. Alternatively you can measure the thickness of the board with a ruler. Be sure to take your measurement from the centre of the board. Please give us a call at 1-866-955-0917 if you are unsure which is the best choice for you!